Zimbabwe is rapidly deteriorating, if not imploding. In the midst of a drought, estimates are that up to half of the rural population will face hunger or famine in the coming year. The economy is contracting, and the government is running out of hard currency, British sterling, the U.S. dollar, and the South African Rand, which it uses since it abandoned its own currency. The government is failing to pay its civil servants and some of its security forces and has imposed a ban on imports from South Africa. Unemployment figures are so high – up to 85 percent –as to be meaningless. The government’s diamond revenue is running out or diverted. President Robert Mugabe – at times referred to as “Uncle Bob” – is 92 years of age, and it shows. His political behavior is increasingly quixotic. He has abandoned a traditional pillar of his regime, the “war veterans,” who played a crucial role as Mugabe’s thugs and drove the white farmers out. He has even threatened the “veterans” with mayhem if they dabble in succession politics. Mugabe’s party, ZANU-PF, is factionalized over the succession issue, with the security services supporting Emerson Mnangagwa while “Generation 40” supports Mugabe’s wife, Grace, as does Uncle Bob, at least for now. Meanwhile, Zimbabwe functions as an inefficiently repressive police state, and regime critics “disappear.” Government spokesmen blame “opposition parties” and “Western embassies” for fomenting unrest. The traditional opposition parties continue to be in disarray and do not provide a credible alternative to the current regime. Up to now, however, Zimbabweans have been remarkably passive, or they have left the country, especially for South Africa, and they are now found all over the world. Though Zimbabwe is divided ethno-linguistically, the Shona are the largest; Mugabe’s mother was a Shona. And, undeniably, Mugabe retains substantial support, especially in rural areas. After all, he drove the white people off the land, and they may come back once he is gone. However, driven by and fear of hunger, passivity may be giving way to anger and manifesting itself outside conventional politics. There are now daily demonstrations and strikes that attract some of the unpaid government employees. The strikes are widespread, though of limited duration. A strike on July 6 is described by the media as the largest in the country’s history; more are planned for the week of July 11. Thus far, they have apparently been non-violent, though there has been some destruction of property. Reminiscent of the early days of the Arab Spring, demonstrations are organized through social media and by hitherto unknown figures. One is Evan Mawarire. He is a pastor but earns his living, such as it is, as a professional master of ceremonies. According to South African journalist Simon Alllison who has interviewed him, Mawaire was driven into political activism by his inability to raise the money for his children’s school fees. His mode of public protest, now widely adopted, is to wear the Zimbabwean flag around his neck. His hashtag, #ThisFlag, has hits in the tens of thousands. 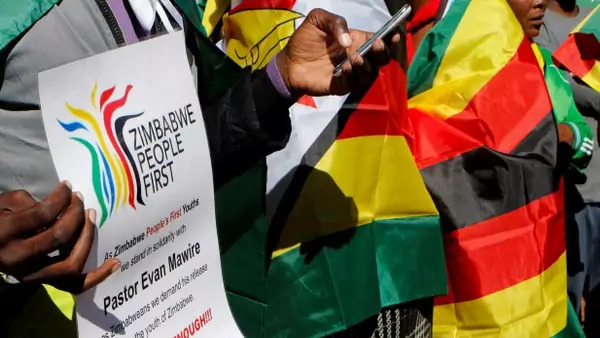 But, again reminiscent of the Arab Spring, Mawarire appears to have no political program beyond overcoming Zimbabwean passivity about a rotten regime, and he claims no affiliation with any political party. The government jailed him on trumped-up charges on July 12. How these strikes and protests evolve will in large part depend on how much violence occurs. There are scattered reports of police violence in “high density suburbs” (slums) outside the country’s largest cities, Harare and Bulawayo. If the security services, those that are still being paid and are loyal to Mugabe, resort to widespread violence, that could ignite deep public rage with unpredictable consequences. An all-too-frequent African pattern is that it is the security services that set off a cycle of violence which then spins out of control. There is also the question of the impact of ongoing public protests on the ZANI-PF internal political jockeying. In so far as the regime is functioning, Mnangagwa appears to be the most responsible, if also the most sinister. A breakdown of order might drive party support his way.